We’re a professional investment research firm focused on understanding and profiting from disruption. You’ve surely noticed that the world is changing… fast. New industries like crypto have sprung up from nowhere. While iconic American companies like Toys “R” Us have shut their doors for good, wiping out shareholders. We’re committed to helping individual investors make sense of the rapid changes taking place, and to profit from them. We write a weekly advisory called the RiskHedge Report. It is currently free to subscribe. Tens of thousands of readers count on the RiskHedge Report to hear about profitable opportunities in stocks, cryptocurrencies, gold, and other commodities. For more on what we do, please read the note below from our Chief Analyst, Stephen McBride. According to Credit Suisse, 1 in 20 Americans is now a millionaire. And in 2017 alone, 1.1 million Americans became new millionaires. What’s certain is that the world is changing faster than at any time in human history. Yet at the same time…many folks have been left out in the cold. In 2018, record numbers of young, able-bodied Americans can’t get work. According to accounting firm PWC, 4 in 10 additional American jobs will be permanently lost in the coming 12 years. And per CNBC, 69% of Americans have less than $1,000 saved. Is it unfair that many Americans are achieving life-changing wealth… while others have little hope of ever retiring? Fair or unfair, the rules of success are clearly changing. I’m a professional investor, analyst, fund manager, and world traveler. I’m also a high-school dropout. Growing up in Dublin, Ireland, I left school to get a job at age 16. I eventually went back and earned my college degree. But to be totally blunt, I’m no fan of classrooms. You can’t learn the really important stuff sitting at a desk. That’s why I’ve lived on four continents and travelled to six (Antarctica will have to wait until my kids are grown). As Chief Analyst at RiskHedge, I’m committed to helping you make sense of and profit from our rapidly changing world. Unlike most “newsletters” out there, I personally put my own money in the investments I recommend. I also manage the RiskHedge Fund, which all of RiskHedge’s founders are personally invested in. In short, the investment guidance we give you is the guidance we follow ourselves. The way I see it, every American has a choice today. They can ignore the obvious changes happening in our economy and markets. They can go on living life as usual, investing as usual, and leave their financial future up to chance. Or - we can seek to understand these changes. To identify and prepare for the risks they’ll create. And most of all, to position your investments to claim your share of the trillions in new wealth created by these shifts. Would you agree that irresponsible borrowing should have consequences? For 99.99% of human history, it has. Borrowing too much money would harm your reputation or your ability to put food on the table. Yet the U.S government owes the obscene sum of $21 trillion in debt. It is, by far, the most indebted nation in history. And by its own calculations, its net worth is -$60 trillion. Yet… there have been few visible consequences. For 99.99% of human history, the idea was absurd. For good reason. Would you loan someone money and pay them interest? Yet here we are. Trillions of dollars in loans around the world carry negative interest rates. Love him or hate him… almost NO ONE thought he had chance in hell of winning. It used to be that just one of these stories would define an entire decade. Today a new disruptive shift seems to rock the world every month. Look at any of these events individually, and it’s easy to feel confused. But look at them as symptoms, and things start to make sense. The pace at which fundamental discoveries of basic science are being uncovered is accelerating. The fact is, more has changed in the last 10 years than the prior 100 years before it. 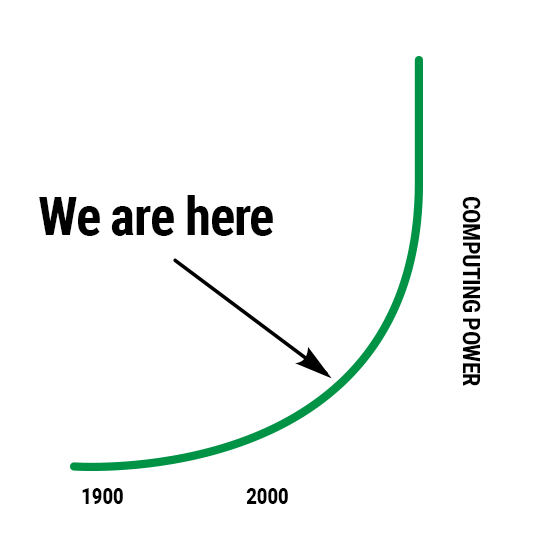 Moore’s Law holds that computing power doubles roughly every two years. As you can see, we truly are living in a unique time. Leaps in computing power have opened up a whole new world of investment opportunity for us. In just the last five years, humans have invented computers that think… built cars that drive themselves… developed cures for many forms of cancer… and figured out how to produce energy efficiently without burning a trace of fossil fuel. What do you think the next few years will bring, as we move to the vertical part of the curve? It’s because transformational change creates big risks. And any smart investment plan focuses first on protecting what you have. Did you know in 2000, the founder of Netflix asked Blockbuster Video to buy his company? Over the next few years, Blockbuster slowly slid into irrelevance and went bankrupt in 2010. Today, Netflix is worth $150 billion and its stock has made many investors rich by soaring more than 4,300%. And did you know the founder of electronics chain Best Buy tried to sell his business for $30 million in 1988? He tried to sell it to Circuit City. Remember them? Circuit City said, “No thanks.” It went bankrupt in 2008 and shut its doors for good in 2009. Today, Best Buy is worth $21 billion and its stock is up more than 600% in just the last few years. My point is, Blockbuster and Circuit City were victims of change. They had every chance to adapt. To understand their world was changing and to act. But when faced with a make-or-break choice, they chose wrong. Should you buy cryptocurrencies like Bitcoin? Sell your oil stocks and buy solar stocks instead? Our mission is to help you choose right. To own the investments that will benefit from disruption. And avoid the ones that will get steamrolled. 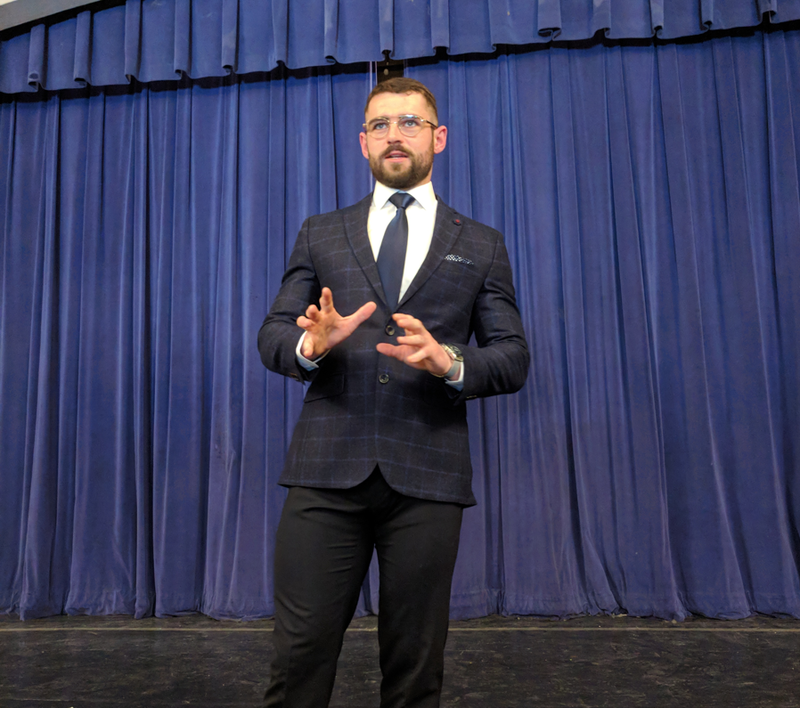 If what I’m saying makes sense to you and you’d like to join our growing community, scroll down to sign up for my free weekly letter, the RiskHedge Report. What we’re investing in now, to help you grow your wealth. The specific stocks, cryptocurrencies, and commodities I recommend buying right now, so you know exactly how to position your portfolio.